If I were to guess what was in your pockets in right now and without knowing who you are, I’d start with two items – a smartphone, and a wallet. Most of us carry around both, but there’s a growing field of digital wallet vendors trying to convince that we can finally put the cowhide sleeve out to pasteur. Ugo Mobile Solutions LP is the latest to join the fray with a Canadian-focused launch of a mobile wallet for Android and BlackBerry devices on Monday. 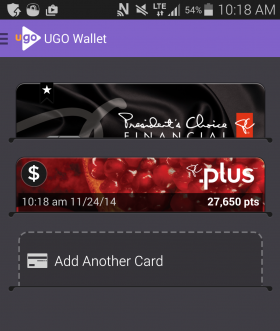 Ugo is a partnership between TD Bank and PC Financial via a separate legal entity to bring a mobile app to market. Ugo is looking to establish a distinct brand for its wallet, complete with anthropomorphized app icons. The app itself stores both credit cards and loyalty cards on a smartphone. It’s taking to market with an open perspective, hoping to find more financial institutions that will offer compatible credit cards and more retailers that want to tie in loyalty programs. It’s also open from a platform perspective, and is working towards the release of an API kit for developers, says Salim Jivraj, chief operating officer of UGO. “Our mission is to take your physical wallet and bring it into the digital space,” he says. That includes expanding to offer up digital replacements for gift cards, coupons, cash, and possible even licences and identification. For now, Ugo is compatible with credit cards from TD and PC Financial. The lone loyalty program included is PC Plus, for customers of both PC Financial and Loblaws stores. The app can be used on smartphones with NFC and a SIM with a Secure Element that are operating on one of the three major wireless carriers in Canada – Rogers, Bell, and Telus. 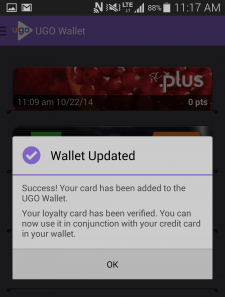 I got a chance to try Ugo in the week leading up to its release on a Samsung Galaxy S5. I set out to use it at my local Loblaws with the mission to complete my grocery shopping without having to pull my wallet out of my pocket. Digitizing my credit card – is it secure? The first thing you want to do with Ugo is add your credit card. You’re greeted by a home screen that looks like a wallet sleeve lined with pockets. Tapping “Add a card” starts the proces, then you choose to add either a loyalty card or a payment card. I chose payment card to put my credit card on the app. There’s an option to detect the card, if it supports tap-to-pay, by holding it to the back of your device. I tried this, but couldn’t get it to read the card. After a couple minutes of moving the card around, I just typed in the details manually. From there, the card slot indicated it was being verified for several minutes. When it finished, I was given the option to automatically add the PC Points account that is linked to my card. I said “Yes” and that card appeared instantly in the slot next to my new digital credit card. The credit card information is stored on the Secure Element of the SIM card, Jivraj explained to me. That’s similar to how Apple Pay stores credit card information, but with Ugo, the information is not tokenized, but it is encrypted. The difference to most consumers is negligible, but it means that in theory it could be possible for hackers that get access to your Secure Element to decrypt your credit card information. But using Ugo to pay with your credit card should be more secure than paying with your actual credit card. I can set up a PIN code to unlock access to the pay feature for starters. If I ever lose my device, it’s a matter of informing my credit card company, which can just cancel the digital version of my card – I can still use the physical version just fine. I did my weekend grocery shopping at Loblaws to test out a transaction with the wallet. Since the PC Plus mobile app was released, I’ve gotten into the habit of shopping with my smartphone in hand anyway – it shows me what offers I have on my device to collect bonus loyalty points. So it was easy to check those offers, then tap over to Ugo to finish up at the cash register. I wanted to test both paying with my credit card and paying with my PC Points at the cash, so I asked the cashier to do two separate transactions for me. First, I used the credit card to b uy my groceries. I told the cashier I wanted to pay with my phone, explaining I was testing a new product. She seemed unsure about how to make that work, so I suggested she set up the terminal as if I were doing a credit card transaction. 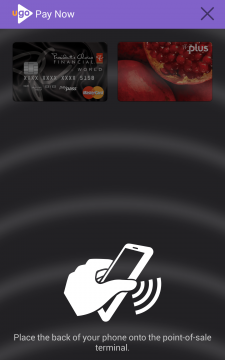 I selected my card in Ugo, then tapped “pay now” and tapped the phone to the POS terminal. It worked right away, the transaction going through. The prospects of me never having to take my wallet out of my pocket was looking pretty good at this point. Next I was buying an assortment of gift cards – filling out some of my holiday gift giving plan – and I wanted to pay with my PC Points. I told this to the cashier, and then chose my PC Points card from the wallet. I noted that it was already updated with my new balance as a result of the grocery shopping I’d just completed – that was fast. I selected the amount of points I wanted to use on the transaction, then my credit card to take care of any remaining amount on the purchase. I tapped my phone to the terminal – no result. I asked the cashier to try again and held my device to the terminal, making sure the animation indicating my active payment mode was on. No deal. I was relegated to pulling out my wallet to fetch my physical credit card to complete the transaction with my points. To be fair, I think the transaction may not have worked because the cashier didn’t know how to set it up properly. She seemed unsure about how to handle the transaction and confused about how I could use my phone to first pay with a credit card, and then pay with loyalty points. Ugo has some ground to cover before I feel comfortable leaving my wallet at home. Aside from the assurance that the payment transaction will actually always work when I need it to, there’s just not enough incentive to change the way I pay right now. Take my trip to Loblaws as an example – I could have easily tapped my physical credit card to complete the transaction on my groceries and still have been automatically credited the loyalty points. I could have also used it to pay with my loyalty points and just told the cashier how many points I wanted to use. What will make Ugo worth using is the ability to store all your loyalty cards and credit cards in one place, to be automatically linked together. Its open approach sounds good, but Ugo will have to deliver on supporting more banks and loyalty programs soon if they really want to get Canadians to close their wallets for good.